This is one of those rare cases where myth and fact cross paths. 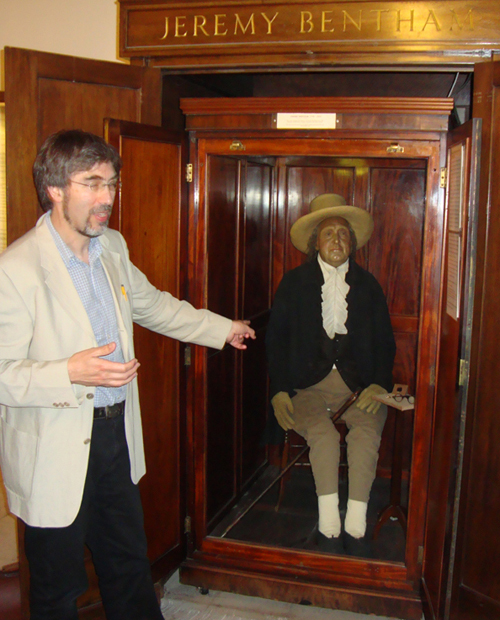 Have you heard the story that Jeremy Bentham’s corpse attended UCL board meetings? As the old story goes, his corpse was collected from its display case and placed in the board meetings. It also states that he was marked as being present, but not voting. But, as we have already said, myth and fact cross on this particular story, and how u=much of it is true? Lets recap. According to legend, British philosopher and social reformer, Jeremy Bentham’s corpse attended board meetings of the hospital of London for 92 years, and that he was noted as present but not voting. This legend comes in part from his own musings on his death. He requested in his will that his body was to be dissected, preserved, dressed in his own clothes and put on display in the University College London. He then suggested his corpse could be present at each board meeting. OK, things just got weird, if that’s at all possible here. When he died his body was indeed dissected, preserved, dressed in his own clothes and put on display at the university. In fact, he is still there today, but without his head. It turns out that his head was stolen as part of a prank by university students. The head that can be seen on his corpse is a wax model. But his request to attend board meetings on the other hand wasn’t exactly honored. It turns out that Jeremy Bentham’s corpse was not present at board meetings for a very long time. But that all changed in July 2013, when his corpse attended the final board meeting of retiring provost Sir Malcolm Grant. He had finally made a meeting. This is where myth and fact crossed paths. Until fairly recently it was only a myth, an urban legend. July 2013 made the myth a fact. For this reason we have classified this as both a myth and fact. Myth because he didn’t attend the meetings for decades, fact because he finally did. Why did it take so long for Jeremy Bentham’s corpse to attend the UCL board meeting? In short, weight, not wait. UCL curator Nick Booth described the myth as laughable and not true, as it took 3 men to move his corpse for just this meeting as it was bolted to its chair and moved in one piece. To complete this task on a monthly basis just wasn’t, and isn’t practical.